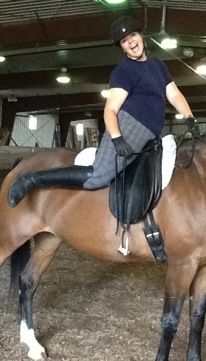 Shorten Your Reins: Adjusting your stirrups while mounted. While there are ways to figure out if your stirrups will be the correct length even before you get on, you'll never really know if they're right until you've mounted. If they're the right length, hooray! If not, you'll either need to dismount and readjust them, or you can shorten or lengthen them while you're still on your horse. It makes sense to adjust them while you're mounted, because you'll know immediately if you've gotten them to the right length. 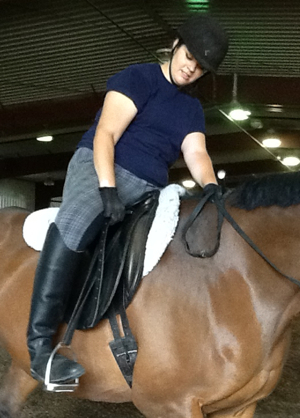 But there's a right (safe) way, and several wrong (unsafe) ways to adjust your stirrups. Learn to do it the safe way, and live to ride another day! Wrong way #1: Leg in front of knee roll. 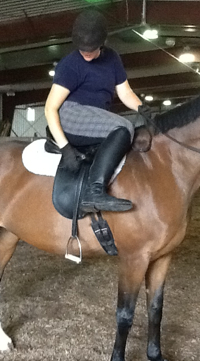 If the horse suddenly moves forward, the rider will lose balance and fall back (and maybe fall off). Wrong way #2: Leg behind saddle flap. For sensitive horses, this will be a clear invitation to gallop off -- and only movie cowboys get to gallop off! Wrong way #3: Try not to find this much joy in kicking your horse in the flank! Our model horse earns extra carrots for not taking off in a crazed bucking fit during this obviously staged demonstration! "But Karen," I hear you saying, "I've used one of the methods above and I've never had any problem ever ever ever." Lucky you! And I've never been in a car accident, and yet I fasten my seat belt every time I get in a car. Practicing safe methods is a good idea even if you ride the most bombproof horse -- you never know when a passing car will backfire, or a plastic bag blow across the ring, or a cat jump out of the rafters, or when a tiny meteorite from the far reaches of outer space will hit the roof of the arena and spook the living daylights out of your horse. You just don't know. And for that reason, it's worth it to always be safe. 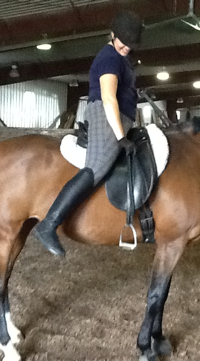 "But Karen," I hear you say again, "adjusting my stirrups the way you want is hard (haaaaa-aaaaaard). I'm not good at it!" Yep. All new skills are hard to begin with. Stop whining. Practice. Get better. The safest way to adjust your stirrups once mounted is to keep your foot in the stirrup. With your feet in the stirrups, you're ready for any emergency. Put your reins (and whip, if you're carrying one) in one hand, and lean that hand on the horse's neck if you need help with your balance. With your free hand, reach in front of your thigh, grasp the stirrup leather by the buckle, and pull the buckle away from the stirrup bar. You'll feel like you're doing a little bit of "legs away" exercise, but your leg will remain in more-or-less the correct riding position. You won't surprise your horse with your leg in an unusual position. Using your hand, aided by your foot in the stirrup (step on the stirrup to pull the leather through the buckle), adjust the stirrup leather to the correct length, testing as you go. 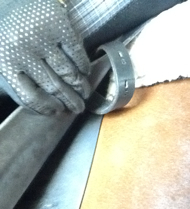 Once you've adjusted one stirrup leather, repeat the process with the other. Remember to switch your whip to the other side so it stays out of your way. 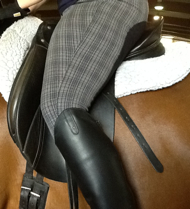 If your stirrups leathers are long, you'll have a long "tail" flapping around behind the saddle. It's a shame to trim the leather -- the next person to use the saddle might need longer leathers. But that flapping tail might annoy your horse. If that's the case, it's easy to tuck in the tail between the saddle flap and sweat (under) flap. A long stirrup leather "tail" might bounce against the horse's side while moving, causing irritation or confusion to the horse. You can tuck that tail between the saddle flap and sweat flap (under flap) and the weight of your leg will hold it in place. Here's a close-up of how to tuck in the tail of the leather. Don't try to put the leather under both flaps and against the horse's skin, which would cause irritation. Oh, and here's a nice website by a professional saddler, with English saddle terminology, so you can always sound like an expert! Thanks to Bailey McCallum and Antares (Annie) for being my models for this project. Copyright 1996-2014, Karen Pautz. All rights reserved. Banner photo courtesy of the very excellent photographer Kimberly Boyd Vickrey. Go show her some love.